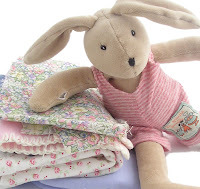 Cottontails Baby: Sunday thoughts and making things..
Sunday thoughts and making things.. This isn't strictly Cottontails related, but - inspired by a few friends on here - I have decided to have a go at making something! Who knows, maybe I will turn out to be a master toy maker and the Cottontails brand of soft toys will be born (!) but for now I simply want to have a play around with some of the faulty toys and imperfect bits and bobs of baby clothing I always seem to have lying around (see the pile of fabrics and the bunny with the poorly arm in the photo) and find out if I am capable of creating anything at all! Also, using up leftover bits and bobs in this way seems to fit quite nicely with the current trend towards 'vintage materials', recycling and general thrifty thinking. Good-luck I’m sure you will make some lovely things! Hi hun, yep every stitch is done by hand. Just can't use sewing machines at all though Mum is threatening to have another go at teaching me! Must have been so cute to see lambs, I didn't realise they were being born yet, must keep a look out for them for the girls! Well done for getting a sewing machine - once you get the bug you won't be able to stop. It has become a bit of an addiction for me!